« Who are the Heroes? What possible interest could there be in a bank in a friendly, though unremarkable town in north London? 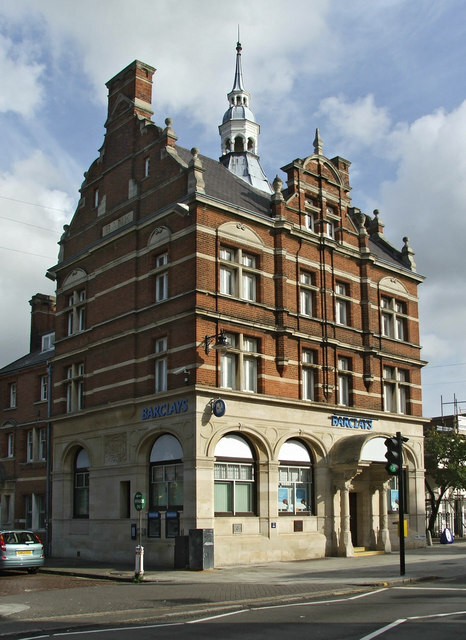 Well the branch of Barclays bank at 20 The Town, Enfield, Middlesex EN2 6LS has a surprising accolade. It is where the first cash machine in the world was installed. Opened on 27 June 1967, the Enfield branch was chosen because it had a ‘model cross-section community, was fairly self-contained and had sufficiently high enough windows and enough space inside for the safe’. Also there was space in front of the building so that customers would not block the pavement. This may sound plausible but Barclays might have chosen Enfield as they didn’t want too many people around in case things didn’t go to plan, and it’s easier to sweep something under the carpet if it’s in Enfield, rather than Westminster. A circular blue metal plaque, that was put on the wall of the bank in 1992, commemorates this: ‘The world’s first cash machine was installed here’ with ‘lives made much easier’ underneath. The original plaque was stolen in 2010, but a replacement plaque made of resin was put up six months later. 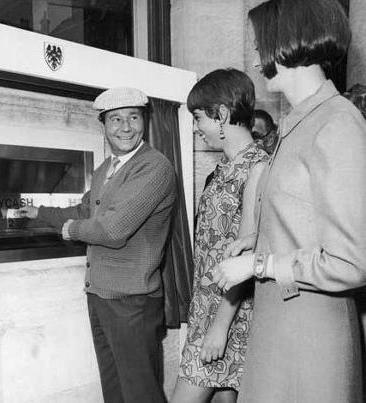 On 27 June 1967, Reg Varney, TV comedy star, dressed in cardigan, slacks, shiny tie and golfing hat, becomes the first person in the world to use a cash machine. On the day, crowds gathered and television cameras began to film. Alongside Sir Thomas Bland, then deputy chairman of Barclays Bank, stood Reg Varney, star of the ITV comedy series On The Buses and a customer of the branch, and so it was Reg who became the first person in the world to use a cash machine. A man was inside the machine to push the notes through in case there was a mechanical fault. Another account however says that Sir Thomas was the first to attempt to use the machine, but it didn’t work, so an employee of the bank, Ron Everett, who had filled the cash machine with notes, nipped inside and pushed a £10 note into the dispenser. Whatever the case, the press got the picture they wanted, of Reg Varney using the cash machine. 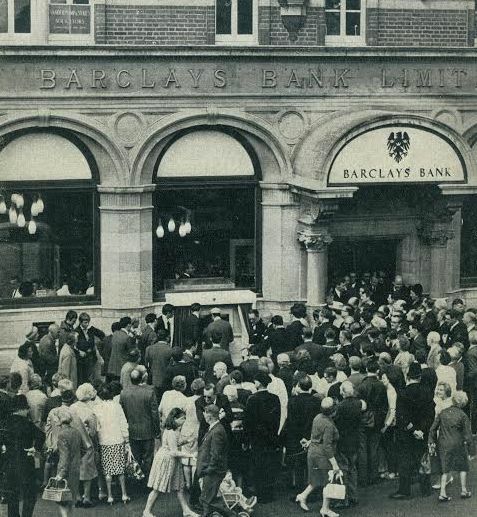 A large crowd gathered outside Barclays Bank in Enfield to witness the event. It looks as if Reg Varney is at the machine with someone to his left making sure he knows what to do. The cash machine was invented by a Scotsman, John Shepherd-Barron, then managing director of banknote printers, De La Rue. One Saturday in 1965, Mr Shepherd-Barron failed to get to the bank in time to withdraw money, and he had to ask a local garage to cash his cheque. That night inspiration came to Shepherd-Barron, allegedly whilst he was in his bath. ‘I started thinking that there must be a better way to get cash when I wanted it. I thought of the chocolate vending machine where money was put in a slot and a bar dispatched – surely money could be dispensed in the same way’. He took the idea to the chief general manager of Barclays, Harold Darvill, who said ‘If you can build them, I’ll buy them’. 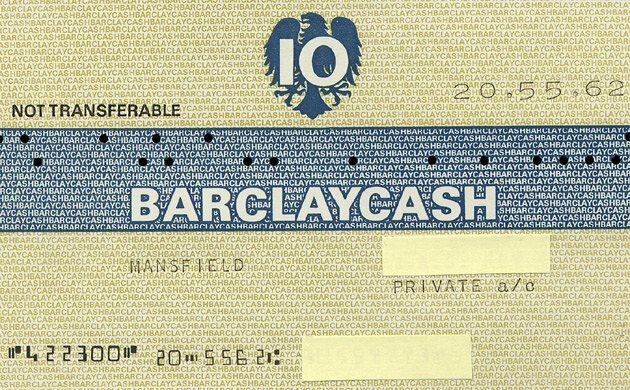 In 2005, Shepherd-Barron was awarded the OBE for his services to banking ‘as inventor of the automatic cash dispenser’. Once inserted, the vouchers, which had been impregnated with a radioactive compound, were checked for authenticity using a built-in Geiger counter. Shepherd-Barron said though, that you would need to eat 36,000 vouchers for them to do you any harm. Incidentally, Reg Varney didn’t have a debit card; they hadn’t yet come into use. Instead you got your money by feeding in a £10 voucher that was punched with dots corresponding to the customer’s four-digit PIN. It’s hard to believe now but the US didn’t unveil its first ATM for another two years – putting a man on the moon in 1969 was obviously a greater priority. Australia shortly followed suit, but their cash machines didn’t instantly hand back the card – it was posted to you! In Britain, five other prototype cash machines were rolled out later that year, but like Enfield, in low-key venues: Hove, Ipswich, Luton, Peterborough and Southend. They were, of course, a roaring success. There are now 70,000 cash machines in Britain and the average withdrawal is £67. Barclays’ most frequently used cash machine is in Camden Town, north London, while a machine at Heathrow Airport dispenses the most money each year. What might have happened if Leicester Square had been chosen by Barclays to demonstrate their cash machine. Imagine Sean Connery punching in his four digits, and then … nothing? I think Reg Varney was a wise choice.